I finished this book a while ago, but I’ve held off on writing a review on it. 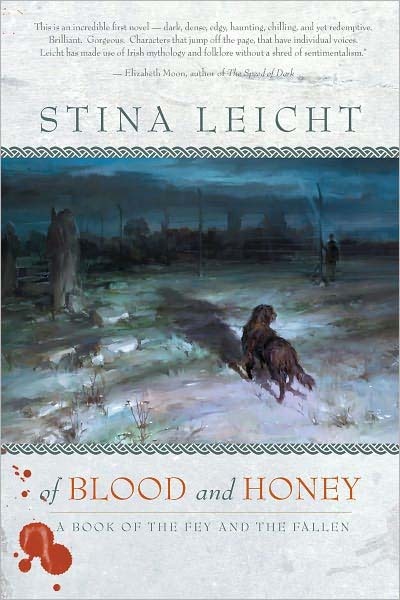 Mostly because I was trying to figure out what I didn’t like about it, because while it’s clear to me that Stina Leicht’s debut and I didn’t connect, I can’t for the life of me figure out why. I think I can confidently say that the issue is between me and the book, and not with the book its self. Blood and Honey has garnered itself a slew of positive reviews across the internet, many from sources I trust. It was these positive reviews that led me to picking up the book in the first place. When it was first released I gave the blurb a once over and disregarded the book as another urban fantasy, yawn. But then the reviews started coming in, painting the story as something much more. The book is set in 1970's Ireland, an era not exactly known for its stability, and revolves around a young kid called Liam. Liam has a real knack for being in the wrong place at the wrong time, and despite being mostly innocent, can’t seem to keep himself out a string of really nasty prison camps. On top this, and unbeknownst to poor Liam, it turns out that he’s part fae. Part nasty, violent, hard to control, beast shaped fae. This is a dark, gritty book. Normally when a fantasy novel is described as dark or gritty you might expect a certain kind of style. 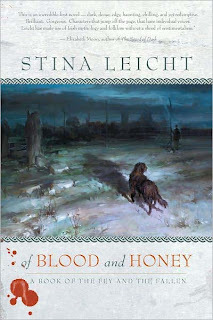 But 'Of Blood and Honey' is not dark in that over saturated, hyper realized Abercrombie/Tarantino kind of way, it’s dark in a much more realistic, human kind of way. This might be at the root of why this book did not work for me. I make no apologies for the fact that I read to escape and be entertained, and there’s little escapism to be found in a book so deeply rooted in the muck and mire of the real world. Reading, for example, about Jant Shira of Steph Swainstan’s Castle book’s drug addiction was entertaining, reading about Liam’s addiction to heroin was just depressing. The fantasy aspects of this book were fairly limited. This was a consequence of Liam being in the dark as to his true heritage for almost the whole novel, and I think we’ll see a lot more of the other worldly stuff in the sequels. What we do see certainly held promise. We have the fae and fallen angels at war with each other, and an order of human priest who think all other world creatures are on the same team, and are trying to eradicate them. Often in these books the ‘ancient order” or what have you has all the answers, and probably my favourite aspect the book was watching the priest assigned to watch over Liam trying to figure things out. The fallen angels, what little we see of them, are delightfully creepy. But as I said, this novel definitely leans more on the urban than it does on the fantasy. Which is another aspect that probably effected my enjoyment. Knowing that the sequel is going to be more fantasy heavy is all well and good, but it doesn’t help with the book I’m reading now. The characters are well drawn. We see the most of Liam, and he’s likeable enough and well meaning, but also a bit of an idiot. He’s definitely more passive than a usually like my characters to be, he tends to do what others tell him or to react to what others do, instead of ever taking the initiative for himself. The character I liked most, who we saw only little of, was Liam’s fae father Bran. Here’s a character with spark and wit, one who makes things happen. We see glimpses of a fascinating backstory, and more importantly, we get the impression that his current story, playing out almost entirely off page, is even more interesting. At the risk of repeating myself, I think book two is where a lot more of Bran will be seen. The question is, can I forget how overall meh I found this book enough to pick up the sequel? I would like to stress one last time that my feelings for this book were hugely subjective. Leicht writes very well, and despite my misgiving I never considered not finishing this book. I think this is one that you’ll have to try for yourself.